Our guides Susan and David were beyond outstanding!! We are coming back! Arrivals are collected at Avignon TGV station, Avignon Centre rail station and Avignon airport. Departures are from Avignon TGV station, Avignon Centre rail station and Avignon airport. For the recreational cyclist who feels comfortable riding between 50 km and 60 km a day. The terrain can vary between flat, rolling and climbs of a few kilometers in length. This type of tour would be ideal for someone who has a good level of cycling fitness and who enjoys riding for riding’s sake! When Peter Mayle wrote A Year in Provence, this was the Provence he was talking about. Sleepy hamlets dozing in the summer sun, villages perched in idyllic settings above rugged valleys. 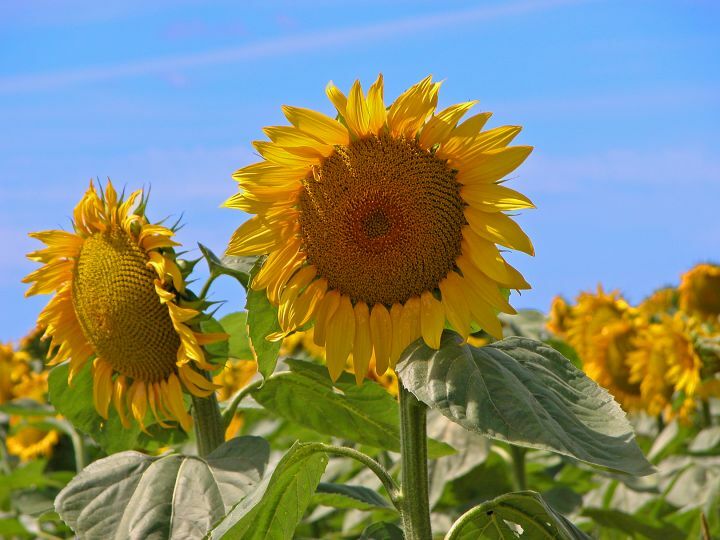 Fields of fruit lovingly tended by the same Provençal families who have looked after them for centuries. Olive groves, vineyards and fields of lavender bathed in the legendary light that inspired artists from Van Gogh to Cezanne. This is the land of Jean de Florette and away from the big towns and cities has hardly changed since Napoleon’s day. Over all of this looms le Mont Ventoux, the ‘Giant of Provence’ , appearing perpetually snow-capped with its treeless limestone crown. Our pick ups are from Avignon train stations or Avignon hotels. Our hotel is situated near the market town of Pernes-les-Fontaines, and early arrivals can relax by the pool, or if timing allows can be dropped off to in town of Isle-sur-la-Sorgue, so named because it is an ’island’ on the many branches of the River Sorgue, which are canalised throughout the town. In the middle ages the town was known as the ‘Venise Comtadin’ (the Venice of the Comtat, as this area as Provence is known). Today the town is a centre for the antique trade, the third largest in Europe. You can wander around the famous market and take in lunch at one of the riverside cafes. In the afternoon we will meet to have your bikes fitted and adjusted to your individual requirements.There will be a short guided ride in the afternoon to the into the village Pernes-les Fontaine, which is renowned for its medieval centre, and the 41 fountains dotted around after which the village is named. In the evening, after a briefing on the week’s ride, we will go out for the first of many leisurely gourmet meals, washed down with one of the excellent wines from the slopes of Mont Ventoux, whose imposing profile dominates the region. Leaving the hotel, the first morning is spent climbing one of the many ridges that cross the area, to the hilltop town of La Roque sur Pernes. An exhilarating descent brings us to the village of Fontaine de Vaucluse. Here we stop to see the famous resurgent spring of the river Sorgue. The river, gathered from rainfall on the adjacent Luberon plateau, periodically boils out of a hole in the ground at a rate of thousands of cubic metres per minute, and if we are lucky it is an unforgettable sight. At other times it is just a big hole in the ground! Even then though, the water coming from the underground fissures in the rock is crystal clear and there is a pump in the village from which you can fill up your water bottles with water directly from the river. Today we are heading into the heartland of Provence - the Luberon - and the picturesque villages depicted in Peter Mayle's 'A Year in Provence'. After a climb over another ridge, there follows a fast downhill, then a rolling ride across the Luberon foothills is followed by another climb into Menerbes. Menerbes, Mayle’s adopted home village, is named after Minerva, Roman goddess of wisdom and art, which made it an irresistible draw for Picasso and Camus who both lived there for a while, Picasso taking up residence in the privately owned castle. The village is classified as ‘un des plus beaux villages de la France’ – a national award scheme for beautiful villages. We drop down from the rocky spur on which the village is perched, then after a luxurious few downhill kilometres, we start the long climb to Gordes. The first 5 or 6 km are a low gradient drag, then the last 3 km will have you searching for the lowest gears. The spectacular vista as the village opens out before you makes it all worthwhile! Gordes, perched on a hilltop and overlooked by its 16th century Château, is perhaps the most photogenic of the Luberon villages. The town takes its name from the Vorda, a Celtic tribe who first inhabited the hilltop. Full of tiny cobbled lanes, and shops selling art and Provençal handicrafts, it is a perfect place to stroll and explore. We will be staying near Gordes tonight, and the afternoon can be spent in the village itself, or there is an optional excursion to the Abbaye de Senanque - a perfect example of Romanesque architecture dating from the 12th C, set in a valley amongst picturebook fields of lavender. The loop to Senanques is a challenging ride – the road climbs out of Gordes before plunging into a deep valley where the Abbey nestles, and the return is even steeper. Then it’s back to the hotel to relax by the pool before dinner. Leaving Gordes we swing east and south through St. Pantaleon before a short climb brings us to Roussillon, meaning ‘red village’, perching above the ochre cliffs. Another of ‘Les Plus Beaux Villages’, the origin of its name becomes obvious as soon as you arrive with the different shades of pink and red illuminated by the morning sun. Roussillon was one of the major producers of ochre for paints and pigments, and boasted 17 different colours. Locally produced pigments for artists are still sold in the town’s craft shops. A sign-posted trail leads to the quarries where the shades of red, orange, yellow and purple rock contrast startlingly with the deep blue Provençal sky. Different sections of the quarry are named “the fairy needles” and “the giant’s pathway”. Continuing south, we cross the Pont Julien – a Roman Bridge over two thousand years old. The bridge was part of the Via Domitia, the Roman road linking Narbonne on the Spanish border to Turin in Italy. We then climb to two more perched villages. The first Lacoste, with its cobbled streets and ruined castle, once owned by the Marquis de Sade. More recently it has become an arts centre, with the foundation of the Lacoste School of the Arts (now run by the American Savannah school of art and design); patrons have included Max Ernst, Man Ray and Lee Miller. Next is Bonnieux, from whose heights a splendid panorama of the Luberon can be had, and whose restaurants mean an enticing stop for lunch. One of the oldest villages in Provence, a monastery was founded here in the 6th Century. It became a stronghold of the Knights Templars in the middle ages. The actor John Malkovich also owns a house here! A long steady gentle climb (brings us up onto the flanks of the Grand Luberon Massif. The route then descends into the village of Lourmarin and our stop for the night. Lourmarin has a delightful village and ancient Chateau. 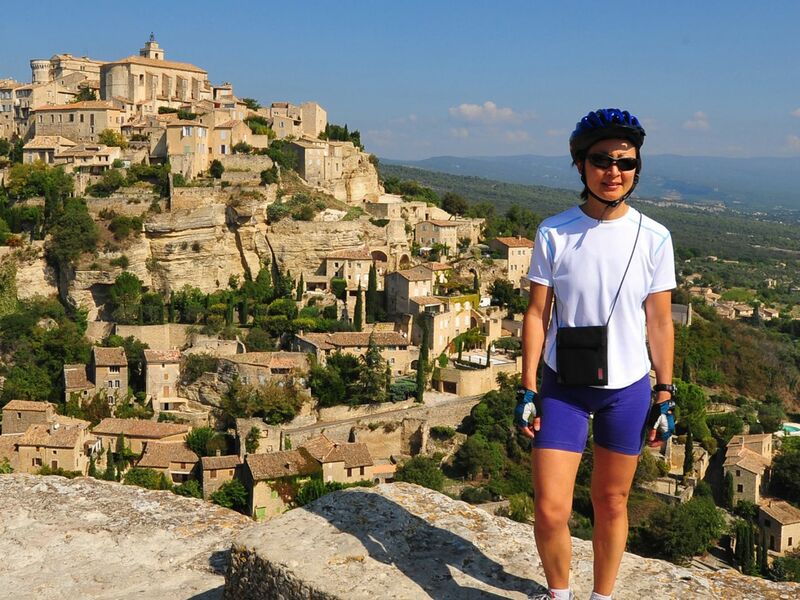 We can forget the packing today and one can choose to styy in the Village of Lourmarin to explore further or ride through some spectacular landscapes from village to village of the southern Luberon massif. The first village we visit is Cucuron, surrounded by the remains of its enclosing medieval walls, and containing a host of welcoming cafés. Next up is La Motte d’Aigues, another medieval gem surmounted by a protestant chapel. For lunch we come to the charming town of La Tour-d'Aigues; at the heart of the village is a renaissance Chateau surrounded by a (now dry) moat, where we can eat in town if the weather is not in our favour or sample another wonderful picnic. The afternoon features a fairly short ride but passes through Ansouis. The village, floating in a sea of vineyards, crowned by its 1000-year-old castle, is a member of the select group deemed worthy of being part of The Most Beautiful Villages in France. Both village and castle are marvellously well preserved, with houses dating back to the 15th century. There is a gentle climb from the start today, going back up the road on which we came into Lourmarin. A short downhill followed by another easy climb takes us through a couple of hamlets before descending into the market town of Apt, where a coffee stop and a sampling of the town’s famous crystallised fruits should provide the energy for a very steep but short rise out of town. After a flatter ride past vines and olive trees, we reach St-Saturnin for lunch, and climb past spectacular gorges and the ancient Chateau de Javon, before emerging into the lavender fields and sheep pastures of the Plateau d'Albion, with immense views of Mont Ventoux dominating the horizon. A long, spectacular, descent takes us to the bottom of Sault before riding up through the town to the hotel. 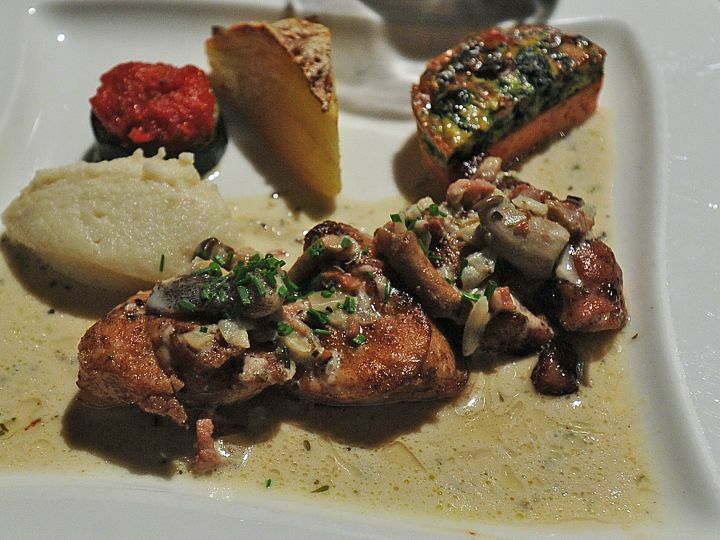 Sault is a local centre for wild products - wood mushrooms, pheasant, wild boar and other game – and one or more are likely to feature on the menu tonight as a reward for the hard work. Before that, a dip in the hotel pool or spa will help to ease any aching limbs! Today there are two options! The more relaxed route descends along the southern flank of Mont Ventoux, nearly 30 kilometres of freewheeling through the breath-taking Gorges de la Nesque. The River Nesque has cut a gorge 300m deep in places, and the twisting road alongside cuts through archways and tunnels in the rock. Be sure to stop at a few of the viewing platforms along the road to take in the magnificent views. It’s not all freewheeling though, and after a coffee in the village of Ville-sur-Auzon at the foot of the gorges, the road goes through the village of Bedoin to meet the other route at Malaucene. For those who would like a bit more exercise, and to take a home little piece of cycling legend, we can climb to the summit of Mont Ventoux. At over 1,900 metres this is not for the faint-hearted, but the approach from Sault (which is already at 750m) is very steady until reaching Chalet Reynard at the tree line. One kilometre from the top stands a memorial to Tom Simpson, a British cyclist who died here during the Tour de France in 1967, his last words 'put me back on my bike'. The shrine here is a pilgrimage for cyclists of all nations, and the offerings of water bottles, tyres and other cycling paraphernalia bear testament to the esteem in which ‘Mister Tom’ is still held. The final approach to the summit, which is devoid of vegetation, is tough, but the effort is more than worth it as you are rewarded with one of the most exceptional panoramas in Europe. On a clear day you can see Mont Blanc to the northeast and the Mediterranean to the south. 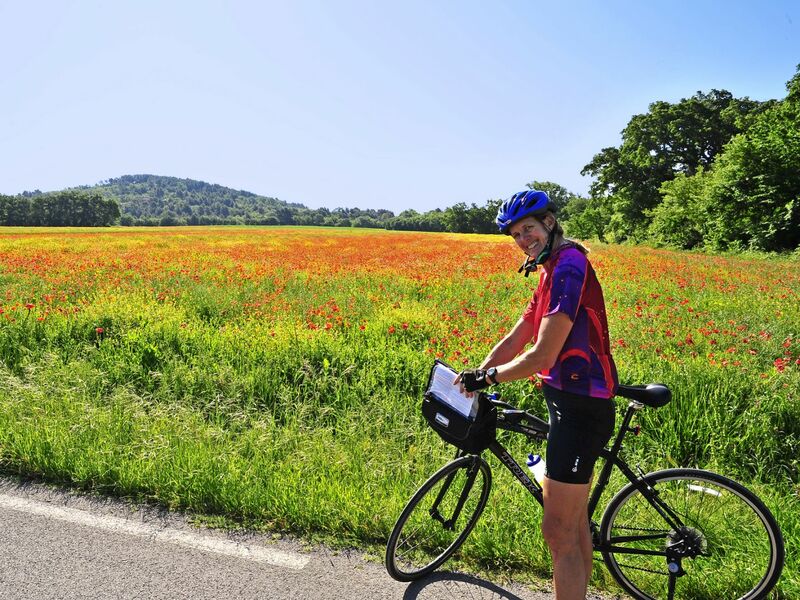 You will have conquered 'the Giant of Provence'! The routes converge in the village of Bedoin for lunch and to recount the morning’s endeavours. The final, easy stretch takes us through the vineyards of the Côtes de Ventoux to our destination in Mazan. Mas (pronounced ‘Mah’) is Provençal for a substantial farmhouse, often fortified. The Mas de Cure Bourse has been converted into a charming 3* hotel with a noted restaurant, and a superb swimming pool in the extensive grounds. Located in the countryside outside the village for complete peace and quiet, it is a short bike ride to the bustling village centre with its canals and markets. Another converted farmhouse complex, the Mas de Senancole is in the hamlet of Les Imberts a few kilometres from Gorges. The 3* hotel has lovely grounds with a substantial pool and a hot tub/sauna. As the name implies, this charming 3* hotel dating from the 18th century was once an olive oil mill. 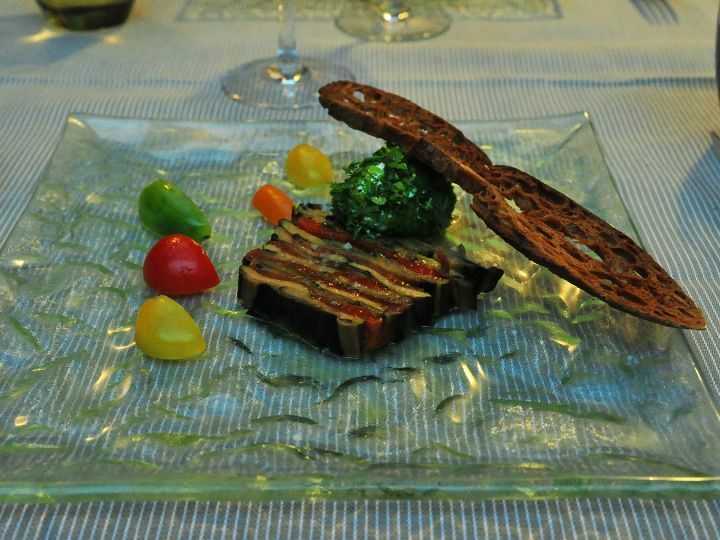 Facing the main village square of Lourmarin, and set amidst the shade of lime trees, the hotel’s restaurant is a culinary destination for the region. Set in a secluded woodland setting, the Val de Sault is a haven of peace with stupendous views to Mont Ventoux. Stunning chalet style rooms and a swimming pool and spa are complemented by a gourmet restaurant. Le Chateau was built circa 1720, during France’s early Regency Period. The most notorious individual within the four walls was the Marquis de Sade. It was here, in 1772, that the Marquis organized the very first Theatre Festival in France. The plays in which he personally performed were shown in both Mazan and Lacoste castles. I meant to drop you an email as soon as I arrived back in Honolulu, a 2 day trek from France, with an overnight in SFO, but was smashed with things to do before returning to work. I want to tell you how much we enjoyed "Villages of the Luberon," on 28 Sept 2008. It surpassed our exceptions on all counts: the 3-4 star accommodations in lovely places, the gourmet dinners, with wine each night, in the most pleasing settings, and of course, our guides, Chris & John. Their combined skills and experience complimented each other and made for great company at dinner, and along the tour. We found the bikes, helmets, and convenient bike bags, with plastic covers for the daily maps and directions, to be excellent. And although, my friends and I were the oldest and slowest on the tour, we found Chris and John to be very patient, helpful, and determined to give us all a great experience. They succeeded. 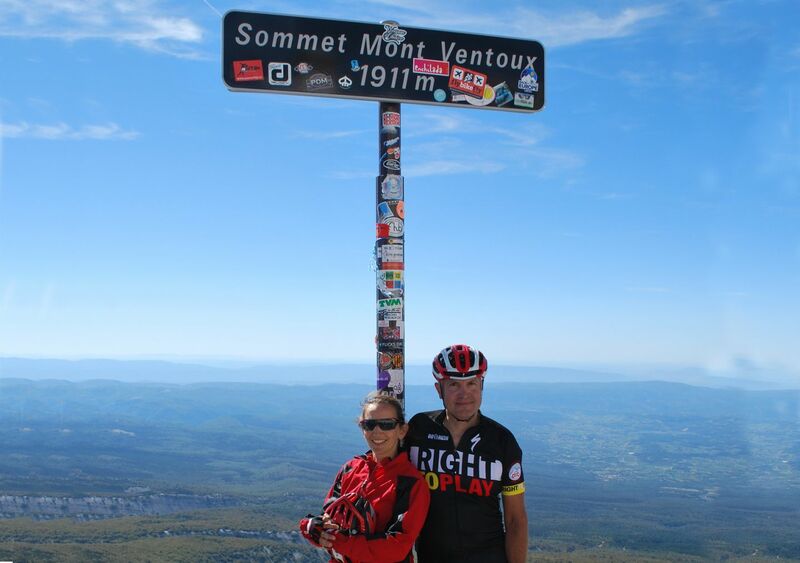 Our group of seven, plus guides, could not have been more harmonious and fun, and the three of us had a ball being the "cheerleaders" for the other four, who rode the Mont Ventoux Challenge with Chris. We will recommend your company to everyone: great organization, superior taste in accommodations and cuisine, and wonderful guides to ensure that your product is delivered at it's best. Thirty-five years in the travel business has taught us what an achievement that is to succeed. Merci Beaucoup for the Grande Experience! "Great holiday! Fantastically well organised. Van great support when needed! Would highly recommend it to our cycling friends."